Passignano sul Trasimeno | Travel Umbria! Passignano is the busiest resort town situated around Lago di Trasimeno. More than a thousand years of art and architecture can be found in this lakeside holiday resort which also offers all kinds of water-sports, tennis, horse-riding, and trekking. The town sits high on its own promontory midway between Cortona and Perugia. 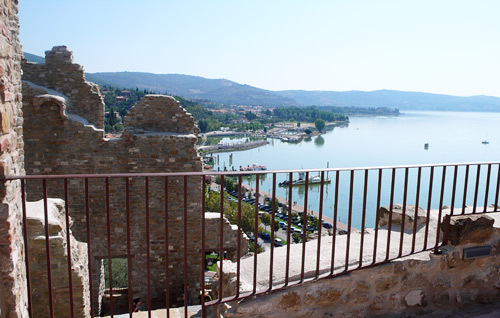 How To Arrive – Passignano sul Trasimeno can be easily reached by car, train or bus. By car – From Florence along the A1: Exit at Valdichiana, take the Perugia – Bettolle highway and exit at Passignano sul Trasimeno. By car from Rome along the E45 Terni-Cesena highway: at Ponte San Giovanni take the Perugia – Bettolle highway. Exit at Passignano sul Trasimeno. If arriving by train, you can either take the Ancona-Foligno-Terontola or the Milan-Florence-Rome lines and exit at Terentola. From there you must take either a us or car to Passignano. There are many buses arriving from Perugia that arrive at the lake daily. What To See In Passignano – The oldest historical center of Passignano sul Trasimeno is still today encircled by the middle age walls which reflect the development the area underwent during the Roman Empire. Passignano evolved from a small agricultural village to a castle, which, after the Lordship of Uguccione II in the 917, was constantly aimed at by Arezzo, Perugia and Florence. Although visitors cannot tour the castle, it is worth a walk up to see the wonderful views across the lake and surrounding countryseide. Unfortunately, not very many historical buildings are left in the town due to the destructions caused by the II the world war bombings. All that remains is in fact the Church of S. Rocco , from the 15th century, and S. Bernardino, erected only a few years later. Near the cemetery, the Pieve di San Cristofo which dates back to the 11th century can be found. It contains restored frescoes that date back to the 1300′s. Just a kilometer or two away from the town the elegant Renaissance Church of Modonna dell’Olivio can be found with it’s high altar and frescoes attributed to Bartolomeo Caporali. From Passignano, the Isola Maggiore (Greater Island), on Trasimeno Lake, can be reached in less than 20 minutes by ferry. There, one can visit the Romanesque Church of S. Salvatore of the XII century, that of S. Michele Archangel of the XIV century and the Villa Isabella of Marquises Guglielmi. For those who love to hike, the surrounding hills around Passignano offer such sites to see as the ruins of the Roman Villa of Quarantaia, or walk to the ancient Fortress of Monteruffiano. Passignano is the head office of the Trasimeno Park Organization. The famous Palio delle Barche, traditional boat race, can be viewed on the third Sunday of July. At this time young people of Passignano dress up in medieval costumes and carry their boats on their shoulders in a procession through town and down to the lake where they launch the boats for the race. There is also a fish festival where you can eat seafood cooked in the largest frying-pan in the world, measuring 4,30 meters in Diameter.